I was sitting on my dragon hovering near our wall thinking “they found me, somehow they did”. 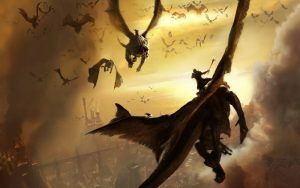 Dragons and other flying creatures were popping into the space around me, most carrying warriors on their back. They were quite a distance away yet but they will be closing in soon. I wondered how long our defense shield would contain them … It will… For a while it will but the battle is unavoidable. “Blow them”,- said the voice of our great wizard in my head. It sounded a lot like the voice of Dumbledore from “Harry Potter” or Gandalf from “Hobbit”, I thought. “The more you manage to blow up now, the less we will have to fight later”. And I thought that was a pretty good idea. And it may also slow them down a bit and give our guys more time to gather, perhaps. I thought all that in a split second and did exactly like the voice suggested. An explosion of magic light rippled the surface of the wall and rushed out, destroying and blowing away everything in its path. And our dragons arrived popping out of the wall, both them and warriors on their backs sparkling bright in the cool light of the morning. We rushed all together down the wall to the foot of the mountain where the battle was starting. I watched in amazement how every our warrior was matched by an equal warrior on the dark side. How they battled and hanged in balance and I realized something deeply that I thought about before but never felt on such a profound level. We are bound to a balance. We cannot destroy the dark and the evil. If we were to do that, what would that make us? We would not be good anymore. At least not all of us. The destroying part would be then the dark side, our friends would become the evil ones, the light would be subverted. We were bound to keep a balance, a precarious balance with the dark side forever if we wanted to keep the light of good in the world. The evil does not have such qualms. They would destroy us and not think twice about it. In fact, if they destroyed the good, the lesser evil would become the good, you know. The evil would split into really evil and less evil, creating this surrogate good somehow. I walked up the city wall on the hill, watched the battle and wept at this realization. And then I realized also that this, what I just imagined, might have already happened. We may just be the lesser evil. The thought horrified me. 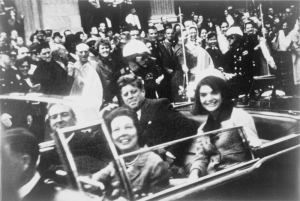 U.S. President Kennedy was assassinated in Dallas, Texas, at 12:30 pm Central Standard Time on Friday November 22, 1963, while on a political trip to Texas. Traveling in a presidential motorcade through downtown Dallas, he was shot once in the throat, and once in the head. Only 46, President Kennedy died younger than any other U.S. president to date. Lee Harvey Oswald, an employee of the Texas School Book Depository from which the shots were suspected to have been fired, was arrested for the murder of a local police officer, and was subsequently charged with the assassination of Kennedy. He denied shooting anyone, claiming he was a patsy, but was killed by Jack Ruby on November 24, before he could be tried. Ruby was then arrested and convicted for the murder of Oswald. Ruby successfully appealed his conviction and death sentence but became ill and died of cancer on January 3, 1967, while the date for his new trial was being set. – Слышь, чувак, – сказал он в своей обычной манере, небрежно сплёвывая шелуху от семечек. – Дай позвонить, а? – Без проблем, – согласился Учитель. – Звони, – велел Учитель. – Ты позвонить хотел, – напомнил Учитель, после того, как с полчаса вразумлял разбойника по почкам. – Чё, не дозвонился? – ласково поинтересовался Учитель. – Наверное, абонент не в сети, – участливо заметил Учитель.